Those who have followed my blog since I was a medical student would already have known this fact about me. I always proclaimed myself as having some spectrum of autism. Hahaha. I hate change of routine. I am usually content with the status quo. I am not very ambitious about my career; again because I hate change of routine. I already like things the way they are…either it’s because I am too lazy to make the effort to change or it must be because ‘aku ni memang dah bersyukur apa yang ada’, ewah. Another autistic trait that I have is: being self-absorbed. I love being in my own world and being left to do my own things. Aku tak kacau orang, aku tak menyibuk dan gossip pasal orang. Tapi kalau aku kena kacau, aku akan balas balik biar setimpal (now that s an anti-social trait as well). To me, it’s all about an eye for an eye. Simple justice. I don’t make friends easily. I am very slow to warm-up to others. I can be friendly with people in general when the circumstance requires it (like in kenduri, during raya, when houseguests arrive etc etc). But to actually call just anyone as ‘my friend’….nope! I have many acquaintances (as attested by the amount of facebook friends that I have), and I have a lot of colleagues. 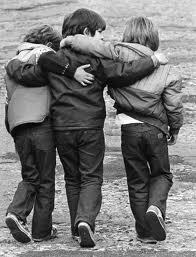 I am friendly with them most of the time… but being friendly is not equivalent to being friends. It only means that you act politely towards them, make small talk about nothing of much importance with them and then go home…retreat into your own inner world where you are MOST comfortable. But friends….I have only a select few. Maybe because I have a very strict definition of what friends are or should be. Of course I don’t go around saying “Person A is my friend. Person B is only my colleague. Person C will only be an acquaintance… Person D is quite charming and could become future friend but not yet.” Hahah. I am not that neurotic yet. I always kept that sort of thing to myself…most of the time I am not even sure where those lines are drawn. But once she has become my friend, I would know it. I would know it because I can be comfortable with her and I can speak my mind with her, and suddenly all conversation with her has stopped becoming another small talk that I have to endure. She has become a comfort zone with whom I can relax down my guard. And I am particular about my pronoun. Noticed that I only use the pronoun ‘she’ when I describe friends. As in female. As in feminine. I don’t believe in having male friends. Non-mahram males can only be acquaintances, colleagues or husband(s). And frankly speaking, muslim women have no business having male friends…boundaries should be drawn that they can only become, at best, your acquaintance or your colleague. Never more. So, you see… to me friends are important. They are few and far in between. Because I cannot simply call anyone friends…I am not that extrovert. So, I cherish their friendships very, very much. They are a very selected few. And one of them has left this phase of single life and has moved on into the life of matrimony. I first met Nurhidayah Janapi when she became my usrah-mate in Kolej Mara Banting, where we completed our preparation prior to furthering our studies to Australia. To be honest, we were NOT friends then. She was not in my class and I would never know her if we were not destined to become usrah-mate in KMB. I am sure we would never notice one another , otherwise. The usrah in KMB was really… ordinary. Jumpa seminggu sekali. Topik dah diberi oleh ustazah kepada naqibah-naqibah. And then bincangkan dalam masa satu jam. Naqibah pun kena perah otak macam mana nak bagi usrah ni best sikit…semua anak-anak usrah macam tak bermaya ja, langsung tak bagi sambutan hahaha. We were not friends then. Have I mentioned that? 2 years passed by…and what do you know, we ended up going to the same university: University of Newcastle, NSW Australia. Even then, we were only acquaintances. Until the semester started…and we ended up being housemates, staying on-campus. We became housemates for four years. In fact, in one semester, we even became roommate! To be honest, other than both of us studying in the same field of medicine, we really don’t have much in common. She is a nice person…I am not so nice. She can make small talk seems effortless….I simply can’t. She is charming, funny and entertaining…. I am not like that, except with friends. She is a real lady (cooking, sewing, stitching, good fashion sense)…. I merely try. I like to read and talk about books …. She doesn’t. Previously, I have always felt like my best friend will be someone who shared my hobby of reading fiction and writing stories… otherwise, what would I talk about with my best friend, me being anti-social and autistic? It surprised me when she has proven to me that sharing similar interest doesn’t have to be the basis for an enduring friendship. Our friendship must have begun…and then blossomed into a full bloom somewhere in that 5 years period. I couldn’t exactly name the exact date, day and time when I suddenly realized she had become more than a simple acquaintance, much more than a mere housemate, better than a loyal accomplice. I couldn’t even name any particular deed, gesture, or noble act that she had ever done before I first realized she had become a friend. I really couldn’t remember any of that except that she HAS become one, for which I am most thankful. There were so many great and not-so-great things that we had done together. Some were embarrassing, some were adventurous, some were merely stupid. There were some pretty clever things that we did also…good things, nice things that I never recalled without a smile on my face. 1)Calling our tutorial-mate as gay when he actually wasn’t! And then he found out about it. And guess what? J did tell M that the Malaysian students in our batch thought that he was gay. For the whole semester, Dayah and I walked into the tutorial room without being able to look at M straight in the eye. Fortunately for us, M was a cool guy and never mentioned it. So, we pretended we never said it in the first place. 2) Laughing like mad during a tutorial session – all her fault. Dayah knows me. I tended to laugh when I heard ridiculous English. It wasn’t because I thought that my English was better than others. Tidak…seribu kali tidak. My English was actually quite mediocre…cukup-cukup makan untuk survive Australia. Tu jer. I laughed simply because ridiculous English was funny! Stomach-tickling hilarious. We had a Korean housemate who would confuse chicken with kitchen. Can you believe it? She would say something like “I eat my kitchen while cleaning my chicken.” Hahha. It took a while for me to get what she was saying. It was uproarious when I finally made sense of what she actually meant. Dayah had given me a dirty look when I burst out laughing. However, I was sure that Dayah knew that I wasn’t laughing because aku nak mengejek or aku rasa aku lagi bagus ke apa. I even laughed at myself when I read my Form 1 English essay. I laughed when things are funny…nothing personal. Usually when I laughed at other people’s English, it was because I remembered my own mistakes and because I knew I could have made the same grammatical error. You may call it ‘a laughter of relief’ that I escaped the same fate of uttering ridiculous stuffs. I really wasn’t doing it in a cocky, jeering manner, I swear! One day in our tutorial, Dayah had pronounced a funny word that I, myself didn’t even know what it meant. I looked at her incredulously. But because she looked so self-conscious but at the same time sounded so confident about her pronunciation, I just couldn’t help it. Like I had inhaled the laughing gas. The whole tutorial class had to pause, courtesy of our boisterous interruption. When Dayah gave me a dirty and embarrassed look, another fresh burst of laughter ensued. I was horrified but I couldn’t make myself stop laughing if my life depended on it. I had to run out of the class to finish my laughing business in the toilet. After ten minutes, I entered the tutorial room and sat next to Dayah…determined not to look at her. I would laugh anew, otherwise. I apologized to her, afterwards, of course. I hoped she knew I didn’t mean it. I was pretty sure she understood my predicament at that time. 1)Fighting with our Australian housemate. I was in my 3rd year med school, I think, when this happened. You see, we got a new housemate that year and she was Australian. Previously, our house were only inhabited by Muslim Girls or Asian girls. Basically, if they were not Muslim girls, they were Asian girls. We were strict about no boys, no alcohol and all that. But one of our housemate had to go back to Malaysia, unable to complete her studies for some reason. So, for a replacement, the hostel management had put an Australian girl in. So altogether, there was Dayah, myself, a Korean girl, and two Australian girls. We were okay about it, initially. I mean, at least we were all girls…no need to worry about wearing our hijab while cooking in the kitchen or relaxing in the living room. But to our surprise, the Australian girls started bringing back boys into the house. We were shocked, of course! But we simply had to adapt and started wearing ‘tudung’ when we went outside the room to cook or watch TV. However, because we were not comfortable with the situation, we spent our time mostly in our own room where we can wear whatever we like. The last straw came when we found out that the Australian girls had given their keys to their boyfriends. Waah…mana boleh! Undang-undang asrama mana boleh bagi kunci to non-residents. Tapi…tak per lagi. Aku sabar. The very last straw happened when one of the girls had a shower with her boyfriend in it. I was shocked and horrified! Kau nak buat apa dalam bilik kau, suka hati lah. But the shower was a communal shower. We had to share the shower….mana boleh kau sesuka hati buat entah apa-apa dalam shower yang kau share dengan orang lain. That was most inconsiderate, kan? Aku dah tak tahan…aku pi bergaduh mulut dengan depa, tulis surat bagai! I went to see the hostel management and complained and fought to the bitter end. Dayah was so stressed because of the fight that happened in the house. Kesian Dayah. Sebab aku perengus sangat, tak pasal-pasal dia pun terlibat sama. At last, we ended up going out of the house into another accommodation supplied by the uni. The hostel management couldn’t simply throw us out…we were already residents and we had paid our rent for the whole semester already. Mana boleh suka-suka hati nak tendang kami keluar. So they supplied us a bigger room…in another section. It was a big studio yang lagi best daripada hostel dulu. But that big studio had to be shared with another person because the rent would be too expensive if paid alone. That was how we ended up being a roommate for one semester. Sebab mulut aku gatal nak bergaduh dan tangan aku gatal nak menulis surat kompelin kat pentadbiran. Hahha. Thanks Dayah, for being a good roommate. It was really fun while it lasted. We became closer, with all those pillow talks at night. I really missed those times. Dayah, Suhaila and I always made plans to travel together. We were, like, partners in crime. 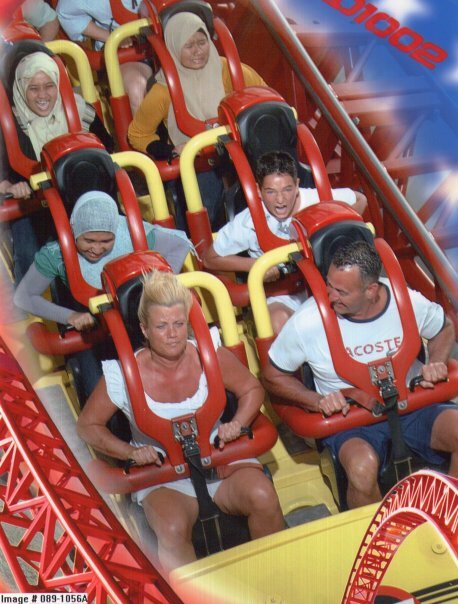 Roller Coaster at Gold Coast. Muka Dayah takut habis. Kelakar gila! Among our most memorable travels was during our Gold Coast trip. That was fun… being kids again at the Movie World theme park, taking lots of pictures with various Disney characters. But the most expensive adventure that we embarked on was the New Zealand trip. Rabak duit aku nak dekat AUD 2 ribu jugalah. Hahaha. Australian Dollars okay!! Tak sanggup aku nak convert to ringgit. You see, other students would travel like students. They would all go to New Zealand, and then rent a cheap car (that’s cheaper than booking a tour agency and you can stop along the way whenever you want in order to take pictures) and crash into the house of some random Malaysian acquaintance in New Zealand. Hopefully, the acquaintances would also cook you some food while you were the guests in their house. Jimat sangat! Tapi kami tak ada kawan kat New Zealand. At least, not in South Island. Sedih tak? To rent a car…- well, we were not a very confident driver back then, even though we all had driving licenses. Hahha. Besides, to drive on the hilly and slippery roads of New Zealand during winter… aku sumpah tak berani. So what did we do? We travel orang-kaya style, of course. What other options did we have? We booked a tour agency. Sleep in hotels/inns or simply at backpackers and we ate at restaurants for the whole seven-days trip. The only time when we actually saved some money was when we finally got ourselves to Auckland Uni, where my sister’s room could serve as our one-day accommodation. 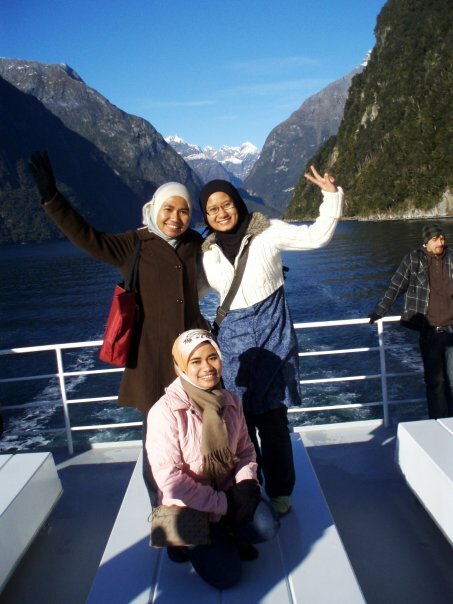 Beautiful Milford Sound – with Dayah and Marni. Memang pokai duit aku semester tu! But it was worth it! No regrets. In fact, I missed those times too. Tinggal Bersama. Makan Bersama. Bermusafir Bersama. Sekiranya kita mahu mengenali seseorang dengan sebetul-betul kenal, kita hendaklah tinggal bersama, makan bersama dan bermusafir bersama. We all know about that hadeeth, kan? It’s true, isn’t it? You don’t really know someone until you have done all three. At least, not in any depth. With Dayah, I had done all three. We were roommates dalam buangan selepas bergaduh dengan orang Australia yang miang dengan boyfriend dia. That was epic! Makan bersama tu…tak payah kiralah; dah berjuta kali kot. Bermusafir bersama pun…hampir setiap kali trip. And that’s how we bonded. Maybe I can never point out the exact time, the exact date, or the exact occasion when we actually moved on from mere acquaintances to friends and then to best friends. But it’s enough to know that it happened somewhere during those trials and tribulations that we had faced together while there were no family members around to fall back on… but only each other. Selamat Pengantin Baru, Cik Dayah comel. I was honoured to be chosen as your bridesmaid. Even though aku ni memang lah tak pandai nak jadi pengapit. Inisiatif tak ada langsung. Nak lap peluh pengantin pun nak kena disuruh. Tissue pun tak ada…terpaksa minta dekat pengapit lelaki. Hiys, memang failed la jadi pengapit. Gagal sungguh. But I thank you for the trust and the honour. I was happy seeing you happy, married to the man worthy of your exuberant personality. Baraka Allahu Lakuma wa Baraka Alikuma Wa Jamaah Baina Kuma Fi Khair. My prayer for your happiness in this life and the hereafter is with you, always, always and forever.